This is what happens when a small group of local pond owners form a committee. 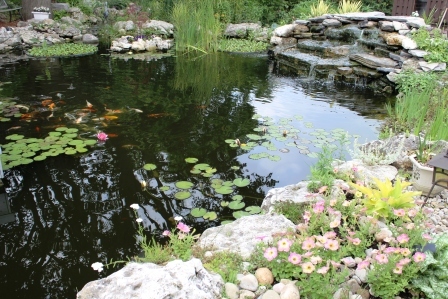 There are myriad Garden Tours, so why not a Pond Tour? There’s no better way to showcase some of the awesome urban retreats–from small ponds and bogs and pondless waterfalls with streams, to impressive koi keeping. You won’t believe what is hidden in these back yards. You’d never guess it from the street! First off, we needed a Major Sponsor. Introducing our Presenting Sponsor, (drumroll please) Grand Valley Garden Village, on old King in Kitchener. I’ve been haunting the Garden Village for years and couldn’t be more pleased that they’ve come on board, in a big way. If you’ve met Dave the Pond Guy there, you know the kind of enthusiasm I mean. We’re really excited about this brand new event on Saturday September 7th, 2013, 9 am to 3 pm. Rain or Shine, as they say. Tickets are $20 a person (which supports a regional non-profit, more on that below). The packages can be purchased at Grand Valley Garden Village, Kuntz Electroplating (front entrance) on Manitou in Kitchener, or A Dutch Mill Flower Shop, 41 Princess St in Waterloo. Not only will there be seven fantastic water features & gardens on the tour to inspire you, your ticket includes a locavore BBQ presented by TwinCity Remax and hosted by The Farmer’s Daughter, a special voucher, plus draws and prizes at Grand Valley Garden Village that same afternoon from 3 – 5 pm. One regional non-profit will be chosen to win an Aquascape Pondless Waterfall Feature, custom designed and built this year (a value up to $10,000). More info here. Every pond owner knows the tranquility and soothing properties of moving water and we’re glad to be able to share this. For example; any non profit can apply to win so please share this far and wide. All they need do is fill out our simple online application from August 9th until midnight August 31st. Non Profits! 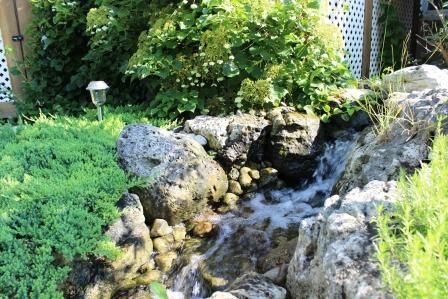 Enter HERE to Win a Pondless Waterfall Feature.